At ScrewSolutions.com, we strive to provide outstanding products with outstanding service. With over 30 years in the construction industry, we know that a reliable product is invaluable. Our extensive selection of fasteners can be shipped worldwide, to keep your project on schedule. Also, we are continually seeking out better avenues to service our customers. Feel free to contact us with suggestions. Available in Flat Head, Trim Head, Finish Head and Heavy Duty. Triple Coated Bronze great for use with chemically treated lumber. 1200 hour ACQ and salt-sray approved! 3/4" to 6". Available in Flat Head and Trim Head. 305 stainless steel for chemically treated materials, high moisture, or other caustic conditions. Available in 1-1/4" to 4". Available in ACQ Compatible E-Coat and 305 Stainless Steel. 2-3/4" Exterior E-coat color matched to 23 common decking boards! 1-3/4" for fascia, fencing and railing! TREX® Approved! Specialized self-drilling fastener designed specifically for fastening wood products to steel or aluminum. Now with corrosion resistant coating! Available in 1-5/8" to 3-1/4". Interior and Exterior fasteners for hard or soft woods. Modified Truss, Pocket and Cabinet screws. Available in 1-1/4" to 3". Our Silver Star "Star Drive" stainless steel Star Drive wood screws are manufactured from the finest quality stainless steel alloys. For use with chemically treated materials and in wood and plywood applications which are exposed to the weather, high moisture and other caustic conditions which make corrosion resistance of primary importance. When corrosion of fasteners could affect structural performance, or just to prevent unsightly staining, our Silver Star "Star Drive" stainless steel wood screws provide the best protection available. Excellent for hardwood, cedar, redwood and other tannic acid woods. Available in Flat Head and Trim Head. Now includes FREE Drive Bit! Our "Bronze Star" line of Star Drive wood screws are designed for exterior professional uses with hard or soft woods, chipboard or other tough materials. The bronze finish gives this fastener extra corrosion resistance. Compatible with chemically treated materials. Available in Flat Head, Trim Head, Finish Trim Head, Heavy Duty, and Heavy Duty Construction Lag Screws. Now includes FREE Drive Bit! Our Gold Star interior multipurpose Star Drive wood screws are for professional uses and demanding industries using hard or soft woods, chipboard and other tough materials - an excellent general purpose fastener. 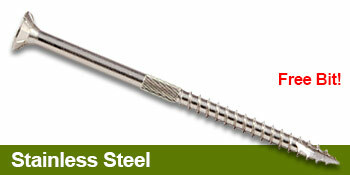 Available in Flat Head, Heavy Duty, Extra Long, Cabinet Screws and Pocket Screws. Now includes FREE Drive Bit! Our Zinc Plated Wood to Steel Reamer Tek Star Drive screws are a specialized self-drilling fastener designed specifically for fastening plywood and other wood products to steel or aluminum. The reamer wings drill through the wood layer and snap off on contact with steel or aluminum. Now includes FREE Drive Bit! 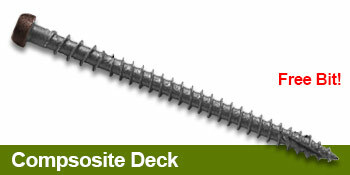 Introducing our redesigned 10 x 2-3/4" ACQ compatible C-deck Star Drive composite deck screws. This screw performs excellent in all composites! Eliminates composite mushrooming, saving you countless hours on the job site. Leaves your project looking clean and professional! This screw will start easily and drives with less torque. Now includes FREE Drive Bit!